Shear Salon has a fresh new make-up bar on location. An inviting full-service make up bar, Cheeky offers its services for bridal parties, photo shoots, make up parties, and a variation of every day or special events. Cheeky features comfortable luxury high-top bar stools with a collection of exclusive Jane Iredale Skin Care Make Up displayed upon the chic copper counter top. Jane Iredale Make Up has been offering the best in anti aging and mineral make up for twenty years and has been featured in such magazines as Vogue and Allure. Martini glasses also decorate the bar with popular eye and lip gloss shades toppled inside. You can relax and watch the flat screen television mounted above the bar as one of our experienced and talented make up artists applies the look of your choice. Complimentary make up touch-ups are also always offered and included in any hair service from the salon. Inquire about our packages and memberships! Bride and Groom Packages available upon request. You always want a clean and natural look for your head-shot. Cheekyby can give you a clean natural look without doing light make-up. Please call or contact info@shear-salon.com for availability and further information. Our at home services start at $100. 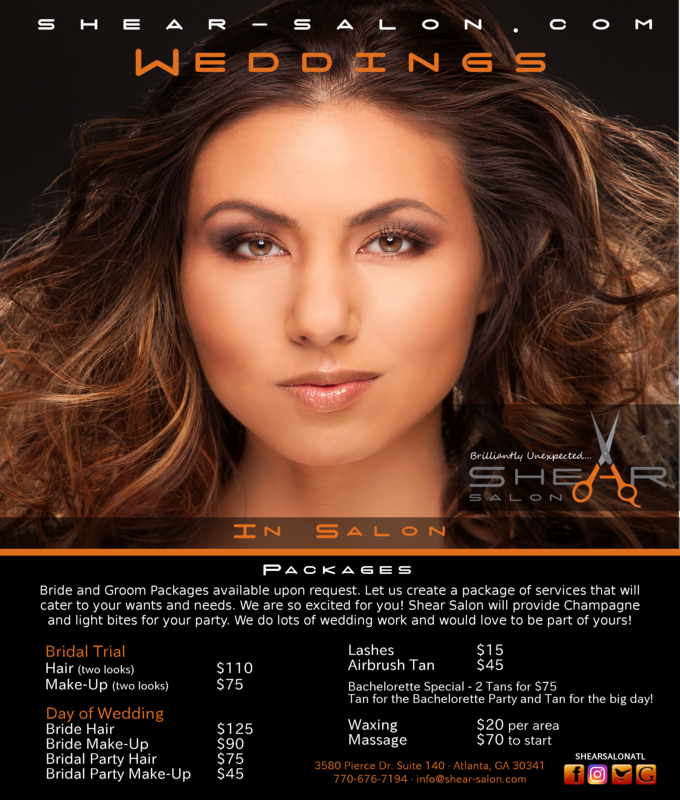 Please call or contact info@shear-salon.com for availability and further information. Bride and Groom Packages available upon request. Let us create a package of services that will cater to your wants and needs. We are so excited for you! Shear Salon will provide Champagne and light bites for your party. We do lots of wedding work and would love to be part of yours!